Wayinfotech Review 2019: Is Wayinfotech a Good Hosting? A simple web hosting provider offering shared hosting from Indian servers, Wayinfotech has been in operation since 1996. The company is based in Bangalore, India. Since 1996, Wayinfotech has been offering web hosting services to clients all across India. The company now hosts over 10,000 websites for its customers. It features both Windows and Linux-based shared hosting plans and free domain registration with all packages. Support is offered in English. Wayinfotech features just three shared hosting plans, which has served its current portfolio of over 10,000 websites well. The vendor boasts that all its plans come with 99.99% uptime and a free domain registration; however, note that the former does not come with an SLA or any promise of a refund to back up this claim. Unfortunately, there’s no mention of MySQL databases, FTP access, or support for any other scripting languages. Furthermore, Wayinfotech doesn’t seem to offer any beginner-friendly tools, such as a website builder or auto-installer. While Wayinfotech’s packages seem to be fairly straightforward, this also works against them in that there are very few technical details as to what you’ll be getting with your purchase. The company has also barely maintained its website — there’s no SSL certificate installed, which left me questioning whether it’s still in operation, and whether its users will have any security protocols protecting their accounts. For those reasons, I would not recommend this provider for anyone. Wayinfotech’s three shared hosting plans are priced inexpensively. This is especially so when you consider that every package includes a free one-year domain registration — typically not found with Indian hosting providers priced in this range. Billing cycles available include one-year, two-year, and three-year terms. What I’m most concerned about is the level of support available with this provider, however. There was zero pre-sales support available — not even an email address that I could contact or a knowledge base to peruse. The only support available is a ticketing system for existing clients, and even then you’ll have to login to your client portal to access this. However, given the complete lack of information on Wayinfotech’s website and the aforementioned lack of maintenance, it makes the company incredibly suspect; I wouldn’t trust my money or time to this provider. 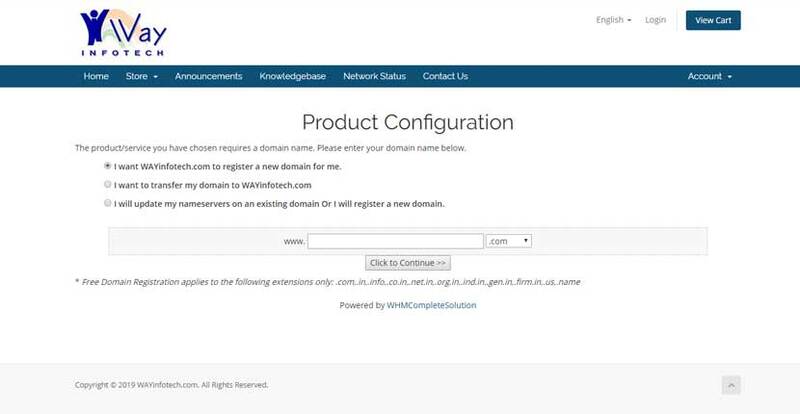 With a poorly-maintained website and the lack of information on the technical specifications of its packages, Wayinfotech is not a provider I’d recommend at this time. While the company’s shared hosting plans are certainly inexpensive, the lack of service and support are much cause for concern. 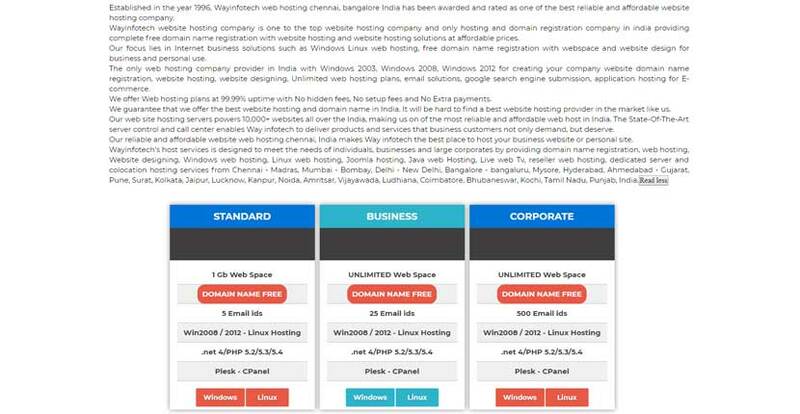 Wondering how Wayinfotech stacks up against other Web Hosting companies? Enter any other Web Hosting company and we will give you a side-by-side comparison.